Quick and deadly, Daiwa Exceler-TSH High Speed Spinning Reels feature 6.2:1 retrieve ratio backed by precision DigiGear internals and four CRBB ball bearings, Advanced Locomotive Levelwind, TwistBuster, washable waterproof drag, and two different-sized spools to accommodate any line type. "I bought this reel (2 pieces at the same time) when I was in Florida last week. I come from Europe and consider myself as a customer who is not able to visit the Bass Pro shop in Ft. Lauderdale any time." ""I teamed my first Exceler with a 7' St. Croix Mojo Bass rod. Consequently I've been back and bought 7 more reels. I use the 2000 and 2500 models. These reels are made very well which results in smooth casts. " 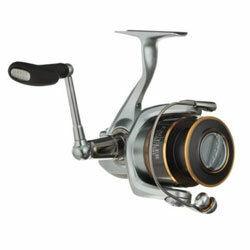 "Another great spinning reel from Daiwa. Good sleek design and smoothness. Great reel for the price. Great addition to my collection."